In the life of a designer, sometimes lots of things happen all at once, and sometimes, nothing happens at all. Here is my mini blog: Everything I can write when I have a free minute. Complex Stars, Simple Steps coming to Mt. Vernon, IL! Ever wanted to learn to make perfect points in complicated designs without having to tear out all those tiny shards of paper? 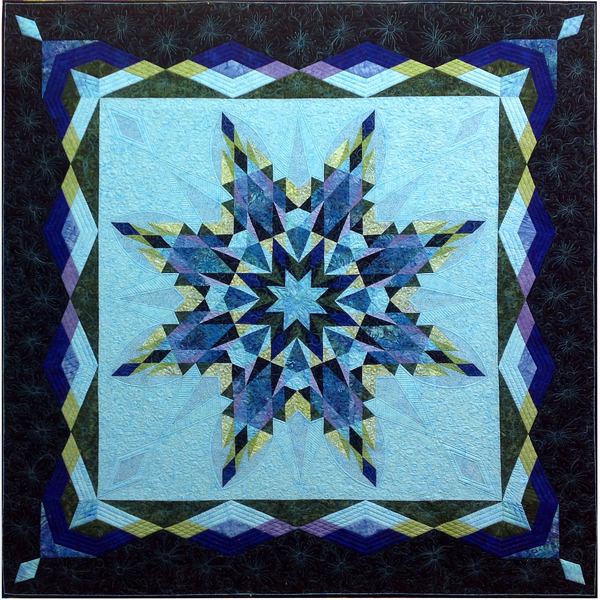 Learn the freezer paper piecing method in this 3-day workshop situated at the beautiful Cedarhurst Center for the Arts in Mt. Vernon. This is going to be an amazing and productive time to learn a new skill in a gorgeous environment! Join us Sept 29 to Oct 1, 2017! Click on the link above for all the information. Things have been moving pretty slow around here since the first of the year. Zanzibar Style Six month BOM is my only release this spring. In March I was hospitalized with sepsis and cellulitis, which I didn't even know was a thing, and have been recovering ever since. After spending years and years with my nose to the grindstone, (lovely grindstone though it may be!) I am being forced to take as long as it takes to get well--a very frustrating project for someone like me who is always working on SOMETHING! So, I remember that it is good to be alive, it is good to have my leg, and the rest of the issues can either be dealt with or will make me more interesting! Cheers! Time to think about Empty Spools 2017! Summer goes by so quickly for me, full of family and designing new quilts for Fall release. This year, that will include a new BOM and another pretty fabulous star quilt. Crystalline Entity comes to Empty Spools! Crystalline Entity was featured in my 2012 book, Blocks to Diamonds, C&T Publishing, which is now out of print. But it was not a project quilt so there were no instructions. The response to the quilt was overwhelming, so I finally worte instructions for this beautiful 86" x 86" quilt. 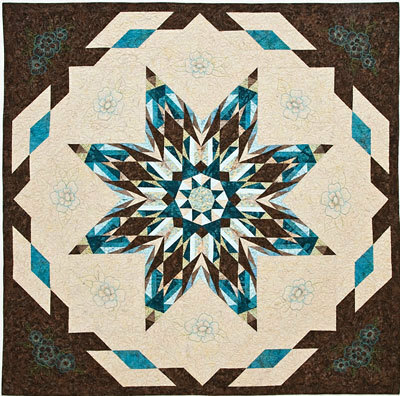 I'll be teaching this quilt at the Empty Spools Seminar April 15-20, 2016 at the Asilomar Conference Center in Pacific Grove, CA. Join me for a relaxing and inspiring week or stitching and learning! Circular Fascination, inspired by the Juniper Collection of fabrics by Timeless Treasures, is the quilt that I spent most of my summer designing and writing. The resulting pattern breaks down the circles into manageable bits of freezer paper piecing with a few templates. The circles are appliqued on a base that has strategically placed seams so you can align those compass points. This could be your next masterpiece! I FINALLy got this pattern ready to go. Spring Garden is made using a "paperless" freezer paper piecing technique so you don't have to give up accuracy AND you don't have to pick out chards of paper. This is the pattern that I will be teaching for the first time at the Empty Spools Seminars April 26-May1, 2015. (See the link a couple posts below). Next year's 6 month class program comes in 3 versions. 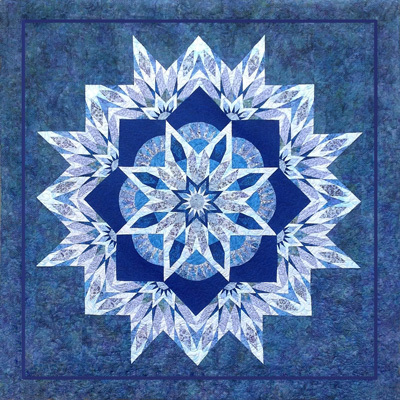 This one is Stars Over Capri, made with Timeless Treasures Tonga Capri Batiks. Below are the Stars Over America (red, white and blue) and Stars Over Vienna (blue and white) made with Timeless Treasures Americana and Vienna collections. These quilts go together beautifully while being easier than you might think. The pattern features beautiful, full color, fabric-specific instructions and is available on the shopping page! Join me in beautiful Pacific Grove, CA, at the Asilomar Conference Center for a week long workshop April 26-May 1, 2015. We will be stitching up this Spring Garden Quilt designed especially for this class using a freezer paper 'paperless paper-piecing' technique. No picking out shards! This is my favorite venue for teaching because we get the whole week together and you should go home with almost all of your quilt completed, but definitely with all your questions answered and a pocketful of tips and tricks. Good food, fabulous location with a boardwalk to the beach, nice accommodations, but best of all, a very stimulating, creative atmosphere! This will be one of the premier venues for quilt instruction in the Pacific Northwest this summer! Hurry to register, as classes will fill quickly. A weekend of quilting workshops to sharpen your skills....while having a blast! ....And all the quilting angels sang Oooh, aah, oh! when they saw my new 20" x 59" pressing station with LOTS of storage. Today I got a box full of my freshly printed Block of the Month patterns delivered to my front porch! It is a 6 month class program designed for beginners, with nothing more difficult than a half-square triangle. Wine Country Sunset comes in 2 colorways--Napa and Mulberry. Hopefully I'll have kits available soon to go with the patterns. The quilt measures 90" x 90", so it's good for a queen size bed. NEW! Neptune's Treasure Pattern with instructions for 2 sizes: 48" x 62" or 64" x 92". Features Timeless Treasures Tonga Batiks.